There was a haunting atmosphere at the Gordon Highlanders Museum in Aberdeen this week. 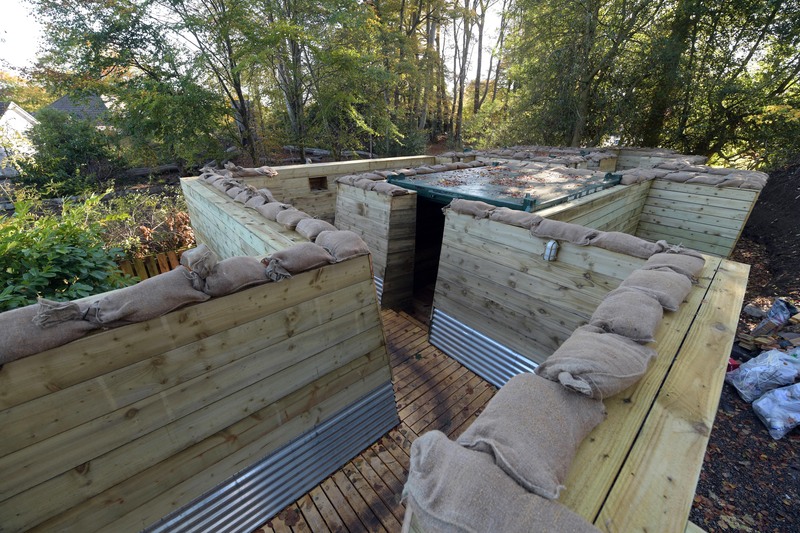 A group of children from schools across the north east walked round the site where a large-scale recreation of a First World War trench has just been constructed at the Viewfield Road facility. An actor, Jack Elvey, dressed as a private on the Western Front, read letters from some of those who actually fought in the conflict. He was young, inexperienced, tremulous; just as so many thousands of his predecessors would have been 100 years ago. And everybody present, from the youngest school pupil to more senior museum volunteers, seemed to appreciate the pathos and poignancy of the occasion on the eve of the centenary commemorations marking the end of the Great War. Work on the Moffat Trench project began in August and the builders have ensured it was brought to fruition on schedule. And although it won’t be open to the public until February, the Press and Journal was offered the chance to explore this flashback to the past. The concept might have moved from the planning stage to execution in a few months. Yet the museum’s chief executive, Bryan Snelling, and curator, Ruth Duncan, explained it had taken much longer to make sure all the details were historically accurate. Mr Snelling said: “Ruth and I went on a tour of other museums around three years ago, among them the Staffordshire Regimental Museum in Litchfield . “They have had a trench, albeit not as authentic as ours, but bigger, at the museum for many years and the curator was telling us that this is a huge draw and allows them to better tell the story around the First World War. 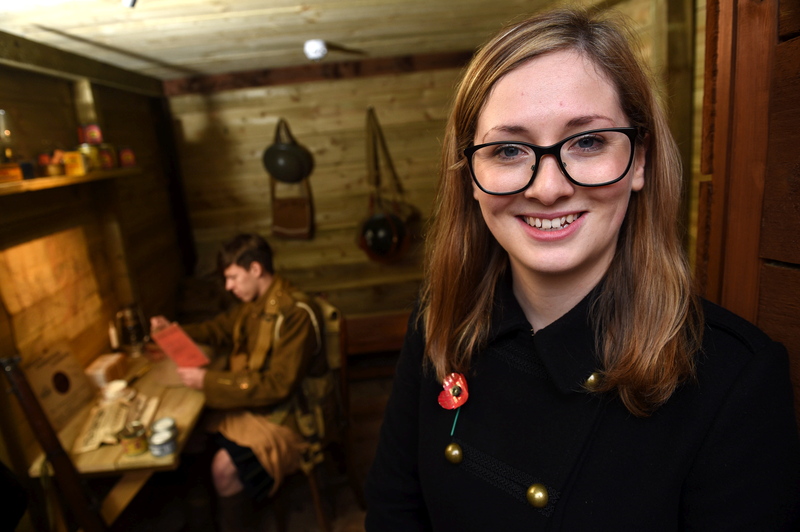 “We felt that this would be an excellent idea for the Gordon Highlanders Museum to be able to tell the story, but do so in a more impressive and interactive experience and so the project was born. “Now that it has been completed, I think the final build is wonderful. It has exceeded all of my expectations and it will be a superb addition to the museum. “We have attempted to make it as realistic and authentic as we possibly can and the contractors and architects involved have done a wonderful job, in tandem with the museum, to recreate an exhibit which we believe will be both a legacy and a remembrance piece. “It’s a focal point to remember the soldiers who served in the trenches and witness the conditions they would have gone through. His words were echoed by Ms Duncan, who has meticulously researched the life and death of so many Gordon Highlanders between 1914 and 1918. Pictured are actor Jack Elvey and curator Ruth Duncan. She said: “I’m really pleased with the fantastic design the architects have put together and the construction company have really pushed the boat out to make these designs a reality. “I think the trench brings the history of the First World War to life in a way that may promote a greater understanding of what it would have been like for a soldier of this period, which is particularly important on this significant weekend. There was a display of art work and poetry, produced by students at Newtonhill Primary School, Turriff Academy and Westpark School and it highlighted the lessons they had absorbed from their classes about the conflict. And Mr Snelling said he had been very impressed by the diligence and imagination which the pupils had shown in bringing their creations to the trench walls. “A few of the poems brought a lump to my throat and the youngsters have been really fascinated by the whole venture,” he said. Given the look on their faces and the way they responded to Mr Elvey’s dramatic monologue, it was obvious they had got the message. The trench will open to the public on February 5. Further information is available from www.gordonhighlanders.com. The roots of the new trench at the Gordon Highlanders Museum truly stretch all the way back to the First World War. The Moffat Trench is named after an officer in The Gordon Highlanders, Colonel Frank Moffat, who was awarded the DSO for his actions in 8/10th Battalion on August 30, 1917, during the Battle of Ypres. Colonel Moffat survived the war and his daughter, Dr Margaret Moffat, was a volunteer in the museum for many years. She wanted the Aberdeen site to mark in some way the sacrifice made by men such as her father and her wider family and was also very aware that her dad took a great interest in the education of young people. Although the construction of the trench has been funded by a number of benefactors, the first and most generous was Dr Moffat. The museum’s chief executive, Bryan Snelling, said yesterday: “Without her assistance, we would not have been able to proceed. 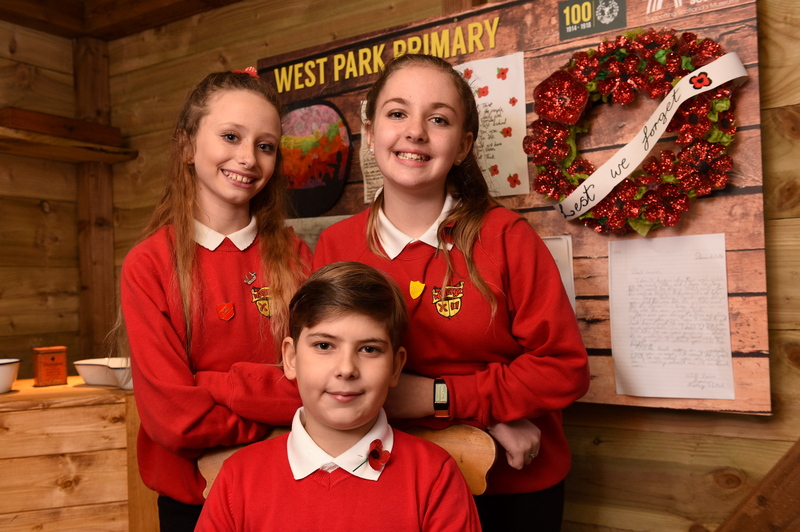 “We both saw the trench not just as a fitting memorial to The Gordon Highlanders of the Great War, but as a way of ensuring that today’s school children could continue to learn from the lessons of the past. “Trenches were named after all sorts of things, including officers. Calling ours the Moffat Trench harks back to this tradition. Dr Moffat said: “My father did not want future generations to go through what his had experienced. Building this trench will help children connect with the past. One of the most evocative works on display at the new Trench in Aberdeen this week was a poem written by Newtonhill Primary 6/7 pupils, Gregor Tait and Zander Ewing. “I knew there was gas in my lungs and I welcomed it.